SoS, July 7: Small Bright Spots. Although some bulbs are making an appearance, much of the garden is having its Winter rest, so this week's post is more about small spots of colour rather than any overall abundance of the kind that Spring will hopefully produce. Most plants need to rest at some time of the year, so I'm grateful to those that do their flowering in the coldest months of the year, bringing pleasure and brightness to cold dreary days. Here are some of my spots of colour this week. 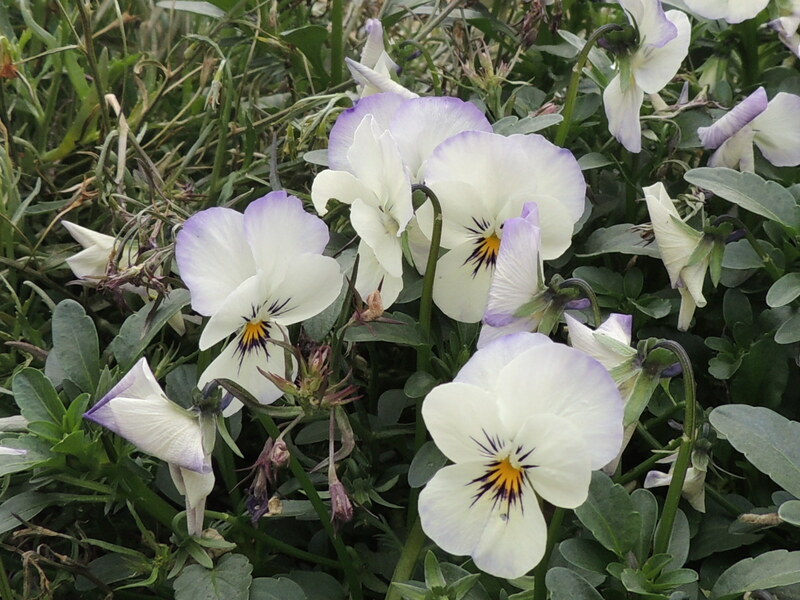 One: Violas are good value plants that pop up in many places, happily flowering in these cold temperatures. I don't know the names of these as I planted them before I realised it was helpful to know more about plants than their common names. 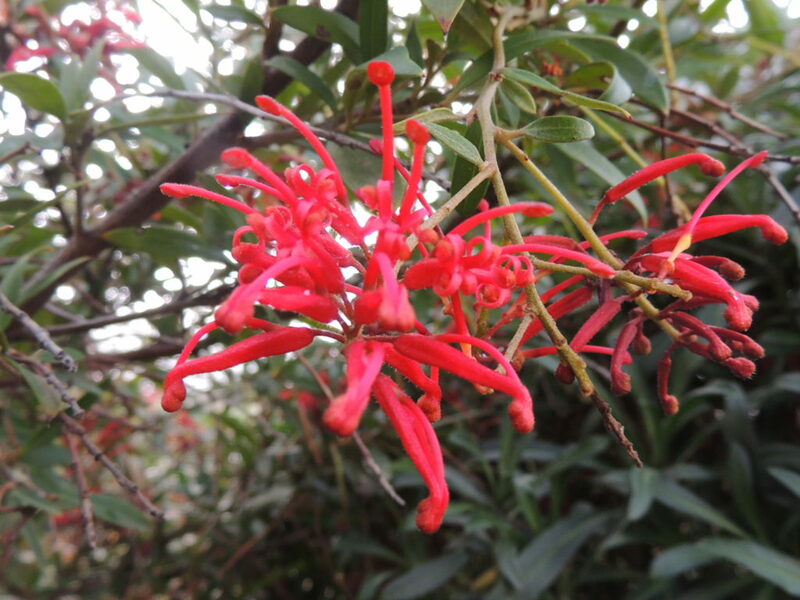 Two: This is Grevillea 'Lady O' who flowers for most of the year. The spidery flowers are quite small for a Grevillea, but they are a haven for honeyeaters like the Eastern Spinebill which frequently visits our garden and enjoys the nectar and the closely packed leaves. Three: Our dwarf Calamondin x citrofortunella microcarpa is having its first fruit and they are joyous spots of colour in a wintry garden. Most people would find the compact fruit impossible to eat straight off the tree but it makes the most delicious marmalade. Four: Banksia blechnifolia. I've posted about this Western Australian banksia before, but now it really seems to be growing some flowers. It's quite an odd plant with its moth-feeler stems, and I'm waiting to see if the fuzzy protuberances turn into flowers. More soon. Five: A small success story. This is Hakea 'Burrendong Beauty' which is a native to this area, having been discovered in the Burrendong Arboretum in the 1980s. It's believed to be a hybrid which occurred naturally there. I picked a small cutting from a garden nearby a couple of years ago, managed to strike it and it has been quietly growing since. This winter, for the first time, it has burst forth into flower along the length of its branches. At first the stamens are like elbows or hairpins, but they unbend to become feeler-like as the flower completes its bloom. Six: Finally, something with very little colour. A photo of part of the garden which shows how hard you have to look for colour at this time of the year. I hope that bulbs will spring up under those silver birches before too long. Flora, with her cornucopia of Echeveria, is keeping a close eye on things. If you would like to see what is happening in other gardens on a Saturday, pop over to the Propagator's blog and take a look. Weather today: What a mixed bag. -0.5 to 11 C, frost, then sunny and windy, then rain. The top was 11, but only for about half an hour. Most of the day it hovered around single digit numbers. Brrrr! Fabulous post! I’m blown away by the cinnamon coloured banksia! Never seen that before and its totally gorgeous! What a wonderful colour. Hi Liz, thanks for the visit. The banksia certainly is an interesting plant. The flowers aren’t fully out yet, so I’ll post some more photos when they are. They seem to get quite large for the size of the plant. Thanks Pauline, I’m rather pleased with the hakea: its flowers are very cheering at this time of the year. Thanks Derrick. It was rather an unpleasant day today. You must be so pleased, Jane. Enough colour there to brighten your day. Indeed, Tracy. Our natives are quite special aren’t they? I am really intrigued by Hakea ‘Burrendong Beauty’ It certainly is a beauty. And what a coincidence. I made marmalade today with fruit, from neighbours, that was being thrown away. Marmalade is such a delicious spread. Glad you like the Hakea, John. I love to see your exotics and how wonderful to have your own oranges – even better if they are good for marmalade. I love marmalade. The Hakea is intriguing. Not heard of that one. Is it related to the callistmeon or grevillea? Seems to have the characteristics of them both. Enjoy the rest of your weekend – hope it is not too cold! Hi, Jude, Hakeas and Grevilleas both belong to the Proteaceae family, Callistemons to the Myrtaceae. I didn’t know this, I had to do a search, which shows how much you can learn when blogging! Green sure is a colour and a lovely one as well. Lovely Six. Very interesting to see completely different species in their native country. That Hakia is beautiful! Thank you. 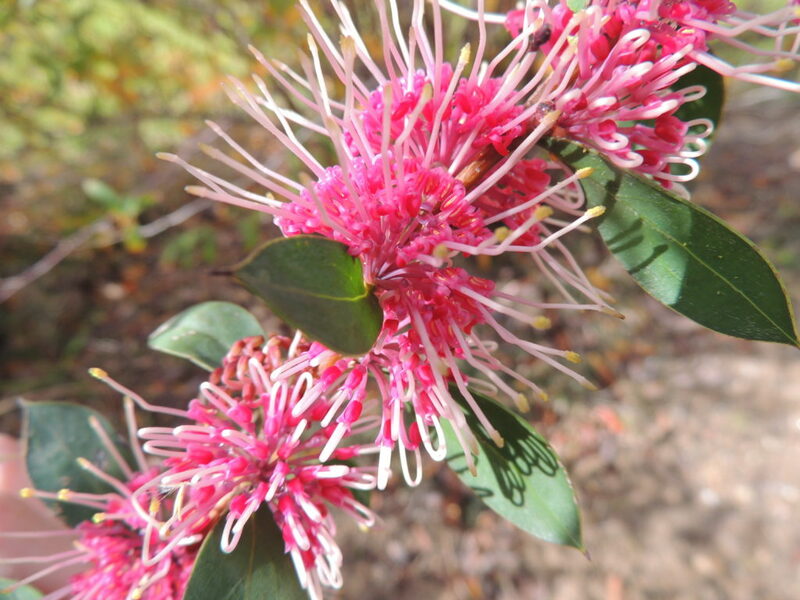 The hakea has very interesting flowers! Looks like plenty of colour to me. Funnily enough, I nearly posted my images of Banksia blechnifolia before I went out today. They are so fascinating when they’re ‘babies, toddlers, young adults or old folk’. 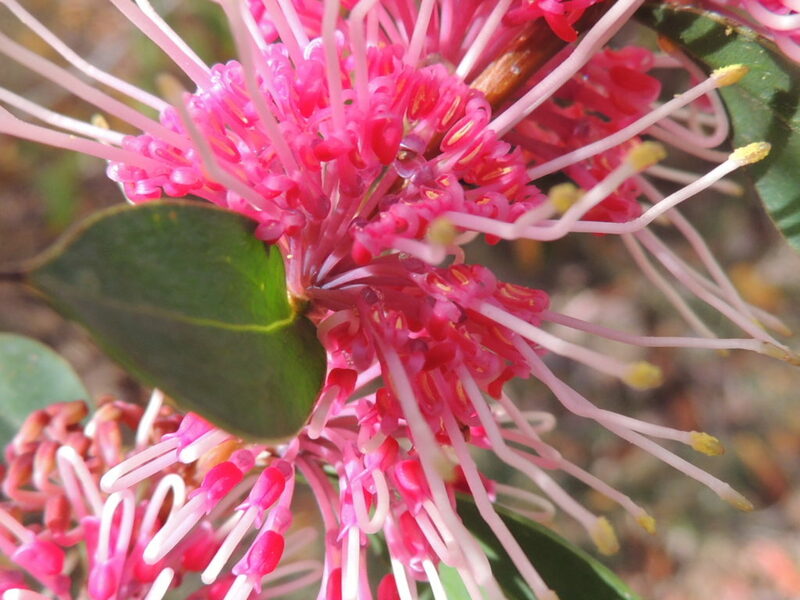 The Hakea is a gorgeous shade of pink too. I like the idea of plants having generations, Vicki! I saw BB when we were in the Melbourne Botanical Gardens. I haven’t heard of this type of citrus before. When I saw the photo I assumed they were mandarins and, by what you say, I would have got an unpleasant surprise if I’d eaten one! Our citrus trees have done particularly well this year. We’ve been consuming oranges and giving them away by the dozen. Great to have so many oranges! 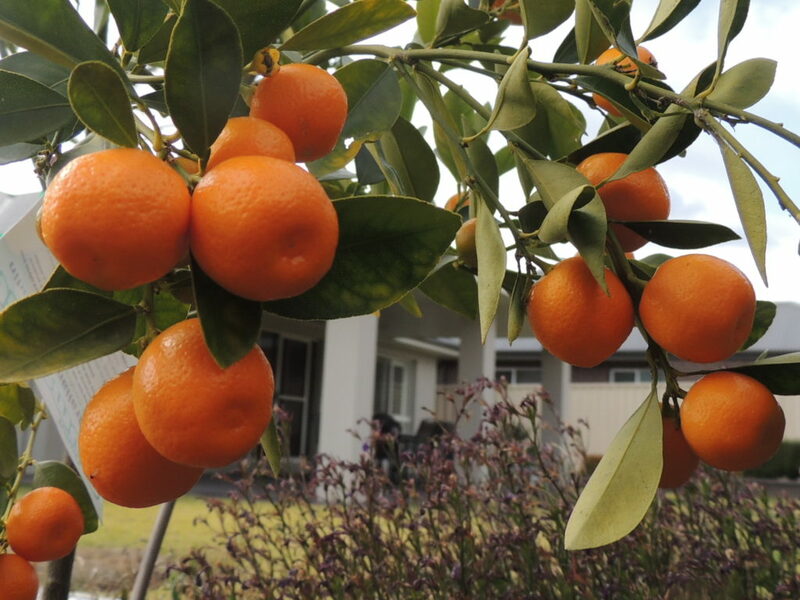 A calamondin is very like a kumquat, and often called that, and sometimes I’ve heard it called ‘Australian Kumquat’. You have quite a lot of lovely color in your winter garden, but I can certainly see how the Calamondin x citrofortunella microcarpa is a bright spot. Thanks, Tina. I’m lucky to have a bit of brightness in the garden just now. Fabulous banksia! 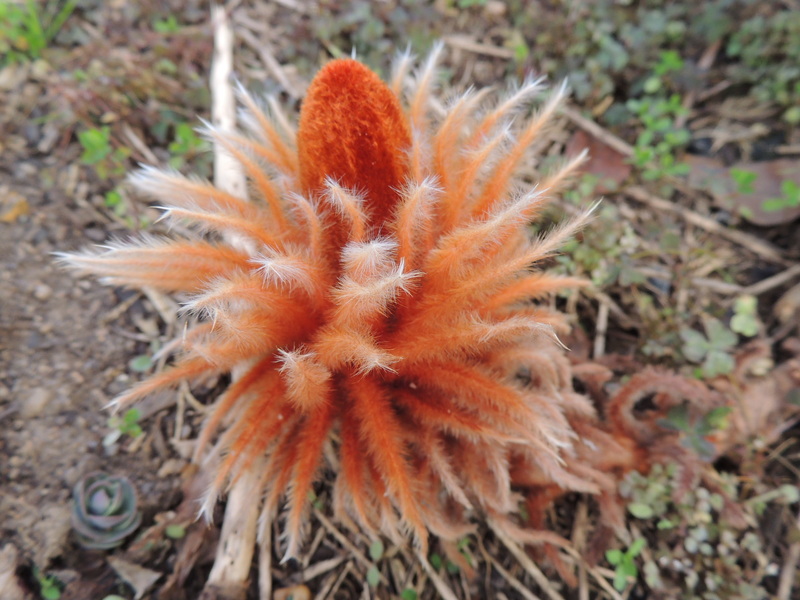 The fluffy flower is so unusual. About calamondins, I grow one in pot as you may know ( a previous SoS next winter) and I also like to eat them directly or to make jam…. 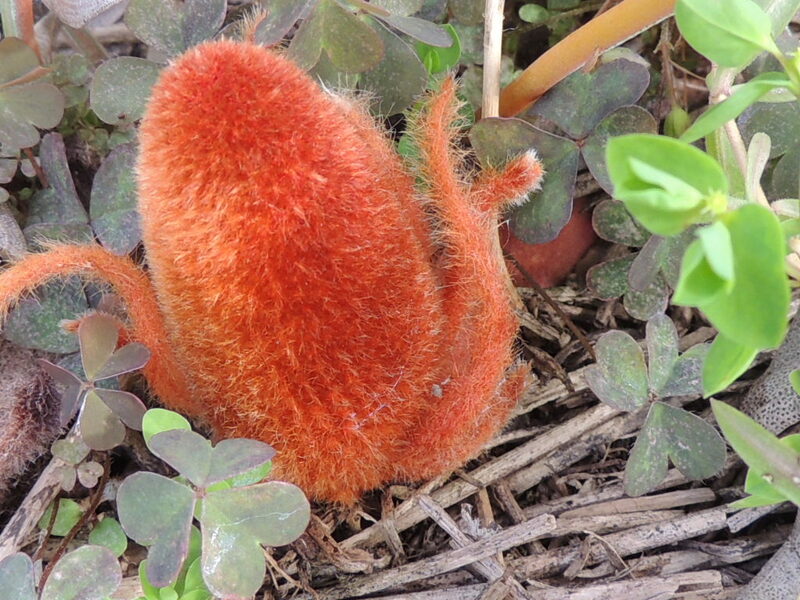 I don’t think the fluffy part is the flower, Fred, but part of the stem. It’s quite strange isn’t it. When you eat the calamondin, do you leave the skin on or take it off? With kumquats, you can leave the skin on! Your citrus fruit (oranges?) look luscious! Hi Ciar, the calamondin are very tiny and a hybrid of orange and kumquat. I haven’t tried eating them straight off the tree, as they are very tart. I’ve never seen Burrendong Beauty in a nursery, but that doesn’t mean it’s not available somewhere. 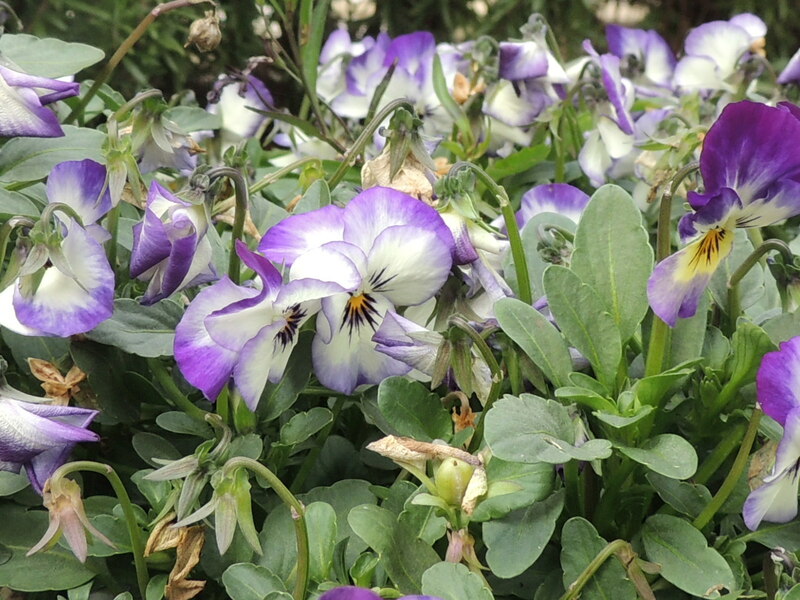 The blooms are quite small, maybe about the size of a table tennis ball when fully out, and very prolific. It’s almost impossible for me to get my head around a temperature of 11C or less when ours passed 43C (110F) yesterday. At the moment, I long for winter’s return! But then we don’t get frost so our winter and yours are very different things. I adore your Hakea. I’ve been looking for one for a few years now. Plants in this genus aren’t commonly available here and those that I’ve found either had uninteresting flowers or grew larger than my garden could handle. Hello Kris, 43…awful. We’ll probably have that a couple of times in the summer, but it’s a very dry heat, so not totally unbearable. The Hakea is quite special, isn’t it. It grows to about 2m so would be quite suitable for you if you could source one. It isn’t very well-known here either, I think. There are one or two Hakeas that will grow outside in the UK but I’ve only seen white flowered species. Several Grevilleas will too, but they’re not well known. The combination of Violas with Grevillea, Banksia and Hakea seems so weird, the conditions they would need here are so different. Strange, isn’t it, Jim. And in town there’s a roundabout planted with Bellis perennis, and it’s flourishing! I think it would be a bit like that Gill as there are almost 300 types of melaleuca, from shrubs to trees. If you post a photo of the flower, I could have a go at identifying it for you. Loving that banksia. Even your no-colour spot is lovely, showing off the birch trunks against the brown & green. Not a bad group of little spots of colour for mid-winter. Thank you Lora. I’ll post photos of the Banksia when it comes out more. Australian mysteries seem even more wonderful and mysterious in the winter. Thanks Cathy, we’re lucky some of them flower when they do. Your photos are beautiful. Our winters here in Chicago are grey, white (if we’re lucky) and brown. I do find beauty in the view as it changes when there are no leaves. In our forest preserves you can see straight through once all the leaves are gone. But I am amazed by all the plants you having blooming in your winter. Love it!! Thank you, Laurine. I like the scenery through branches too, especially a tracery of branches against the sky. Thanks for the visit. 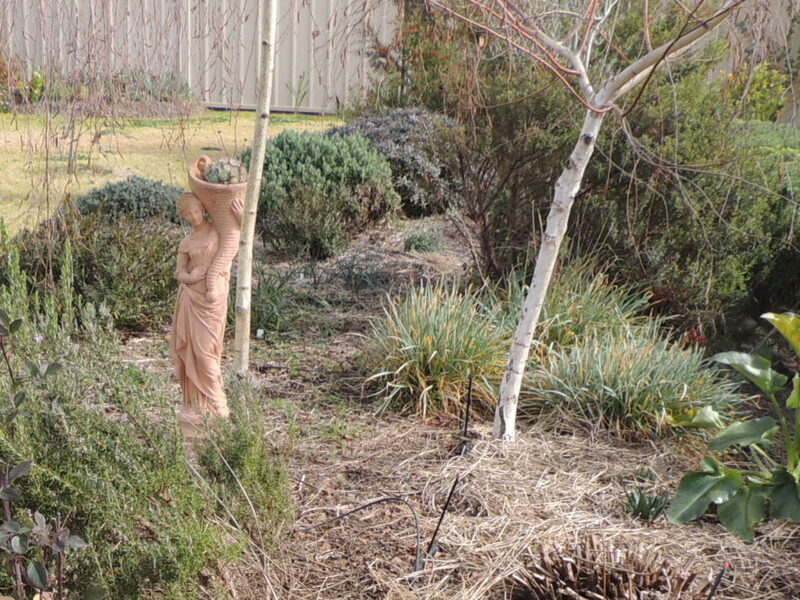 I love both Grevilleas and Banksias although I have neither enough space or sun to grow either. Well done on the Hakea propagation!